Limit 1 per person. Valid toward menu items. Valid only at listed Aurora location. Pick-up only. Must mention voucher when ordering. Promotional value expires 60 days after purchase. Patterns tell us exactly what to expect, leaving us unsurprised when our dog fails to bring us our slippers yet again. 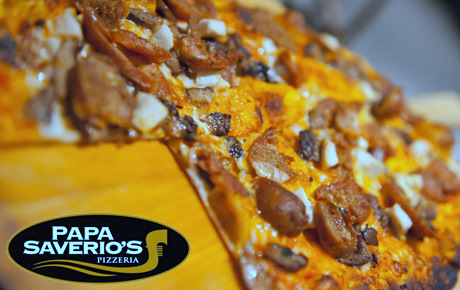 Visit a restaurant with a habit of producing delicious food, and bite into a slice of pizza with this deal for 50% off anything on the menu at Papa Saverio’s Pizzeria in Aurora ($20 value). This deal is only valid for carry-out orders at this location. Papa Saverio’s Pizzeria has a fully loaded menu with everything from chicken wings and pasta to sandwiches and dessert. However, their claim to fame is pizza, and they serve it up in thin-crust, double-dough, deep-dish and stuffed varieties. Grab this deal and pick up some pizza and more at Papa Saverio’s Pizzeria.